Fighting desperately to get back in the game, the Brooklyn Nets kept going smaller and smaller until they essentially had four perimeter players on the floor. Good luck stopping Kawhi Leonard, Pascal Siakam and Serge Ibaka with that. 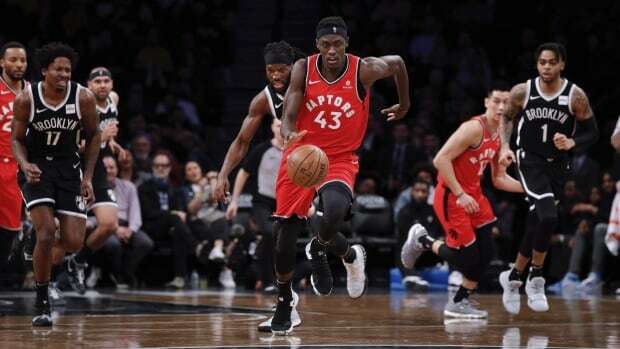 Siakam had 28 points and 10 rebounds, Leonard added 26 points and nine boards and the Toronto Raptors beat the Nets 115-105 on Wednesday night for their fifth straight victory. Ibaka finished with 23 points and 12 rebounds for the Raptors (56-23), who need to win their final three games to match last season's franchise record for victories. Their victory prevented the Milwaukee Bucks from clinching the No. 1 seed in the Eastern Conference. "They were the better team. I don't know how else to say it," Nets coach Kenny Atkinson said. "They were better from start to finish. You have to give them credit. They're a team that's going to compete for a championship. We were not up to those standards that you have to be almost perfect and we weren't. I would say we were average and that's not good enough to beat that team." D'Angelo Russell had 27 points, seven rebounds and six assists for the Nets, who fell to 39-40 and missed another chance to improve their playoff situation. They could have moved ahead of Detroit after the Pistons lost to Indiana, but instead are now tied for seventh with the Orlando Magic. Russell tried to jump-start a rally early in the fourth, scoring seven straight Brooklyn points to trim it to 92-87. He scored 18 in the final period, taking advantage of the space the Nets created with their small lineup. But they got punished on the other end trying to match up with Toronto's versatile forwards, all 6-foot-7 or taller. "We obviously said there's some size advantages out there," Toronto coach Nick Nurse said. "When you get some mismatches and you get a small guy on you, start roaming around in the paint and try to get some putbacks." Siakam, Ibaka and Kyle Lowry made 3-pointers over a span of 1:40, before two free throws by Ibaka and another by Siakam pushed it back to 108-96 with 3:15 to play. Russell had one more flurry, making three 3-pointers to cut it to 110-105 with 1:24 left. But Ibaka scored on a follow shot and the Nets couldn't get anything else to fall. "They're a good, veteran ballclub," Nets guard Spencer Dinwiddie said. "Every time we were able to close the gap they tightened the screws on their end. They got the big stop or made the big shot. That was the difference." Siakam scored 18 points after halftime. "I kind of got thrown off like at the beginning of the game just seeing the way they were guarding me and I got a little excited," Siakam said. "I just had to calm down a little bit and let the game come to me."